Here is the 2016 runtime shootout results. Making their debut is the iFlash-Solo and iFlash-Quad, it will be very interesting to see how 4 MicroSD’s compare against the fullsize SD cards used in the iFlash-Solo & iFlash-Dual. 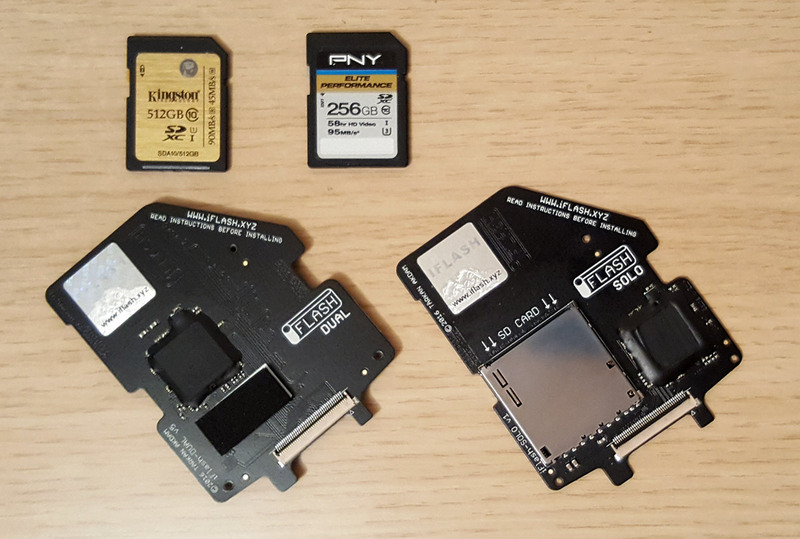 During April 2016, all the SD iFlash adapters were updated to a new platform (internally named iFlash85), with this new platform I have squeezed a little more efficency out of the chipset as well as reducing power and startup times – however, the agressive power saving used in the iPod’s means that the iFlash board sits idle most of the time, so this will not result in much change in the final runtimes compared to the previous platform. The test is pretty simple – load up each storage option with the same music, hit play and see how long it takes for the iPod to shutdown. While in actual use the runtimes will be shorter, it still provides a very useful comparison of the different storage mediums. Test was conducted on the 7.5g iPod Classic, originally came with 160Gb hard drive. I chose this as the original 160Gb hard drive is very efficient as far as spinning platter disks go and the 7.5g itself is the most efficient of this generation of iPods. iTunes was used to restore and sync the iPod, the same library was used with all the storage combinations, of course the iPod only sync’d as much as would fit on the storage installed for each test. Two playlists were created one comprised of 320Kbps MP3 tracks, the other Lossless m4a tracks. I decided to do this as the frequency that the iPod reads from the storage device varies depending on bitrate of the music – e.g. with 320Kbps MP3’s the drive is read every 8 to 12 minutes, where as with a high bitrate lossless m4a the drive is read every 1 to 3 minutes. Very dramatic difference which will have a huge impact on runtime results. For the iFlash-Dual and iFlash-Quad tests we made sure that the tracks in the playlist were spread across multiple SD card, this was easily done using a disk analyser and manually syncing the library in iTunes. I ran some drive benchmarking tests to get a feel for the read and write speeds of each storage medium. As this was a test from computer to iPod, the results would ultimately be limited to the maximum the USB2.0 bus would allow. Interesting none the less. The mSata and HDD hit the USB2.0 limits with approx. 22Mb/s read and more importantly for syncing 32Mb/s writes to the iPod. The SOLO/DUAL trails here at approx. 23Mb/s writes and 14Mb/s reads – this is expected as the SD platform is spec’d for 25Mb/s transfer rates. The DUAL shows a 1Mb/s improvement on the read speed, this is down to the improved speed of the UHS-I U3 class compared to the U1 class. MicroSD cards have sadly not reached the same speed as the full size SD cards yet, but the Sandisk 200Gb did perform very well and are the fastest MicroSD cards I have tested so far. Lets see what this does for actual iPod use by measuring boot time and how long each storage medium takes to fill the read-ahead buffer in the iPod, this will demonstrate the access times and user experience when scrolling and searching through long track lists. Interestingly, it looks like the storage read speed does not impact the boot time as much as you would expect. Considering the mSata read speeds are much faster than the SDXC. The SDXC only takes 2 seconds longer to boot – The overriding factor is the time the iPod takes to parse through the iTunes database. As a reference, freshly restored iPod boots up in around 24 seconds. While the SD cards have the slowest raw transfer speeds, they are hands down winners of the Read-ahead and access times test. HDD is the slowest at 7.5 seconds which was to be expected as it takes over 1 second for the drive to spin-up before actually reading any data. The mSata comes in 2nd with a time of 6.7 seconds this maybe surprising but the SATA bus actually takes some time to handshake and negotiate the link from powerup. The SD platform is designed to be ready for access in under 100mS, and the SD cards have virtually instant access times – which result in a blistering 5.7 & 5.6 seconds buffer fill times. The User Experience reflects the benchmarking results above – the ultimate in smooth scrolling through thousands of albums, near instant album art display goes to the SD cards….. So as mentioned above we have two playlists, one with 320kbps MP3’s (~6Mb per track) and the other with high bitrate lossless m4a files (~30Mb per track). The iPod was fully charged, reset and booted up, the playlist was selected and played. This was done for the MP3 and Lossless playlist for each storage combination. I setup a low tech IP camera to take a photo of the iPod every minute, which allowed me to time exactly when the iPod switched off (to the nearest minute). This was always the expected outcome, the mSata drives draw quite large currents during powerup and my iFlash-sata itself has a high performance chipset converting a very high speed SATA bus to the slower iPod PATA bus. The HDD returned a solid performance and sits in the middle ground but having the drawback of its limited capacity. The most surprising element of these results is in the SD card realm!! The iFlash-Quad wth 4 MicroSD cards effectively has the same runtime as a single full size SD card. The iFlash-Dual also comes in with excellent runtimes – again all of the SD cards based iFlash adapters return amazing runtimes. iFlash-Dual & iFlash-Quad are able to return good runtimes due to the highly efficient power saving features which keep any cards which are not being used in an idle / sleep mode, so in effect most of the time only one card is active and being accessed. To analyse the runtime results further I wanted to look in to actual power consumption of each storage option and how much power the different combination of cards consume. For this set of tests, I done a full sequential read of the entire storage space while recording the power consumption – the results have been averaged. Average power consumption figures only tell part of the story, while the two mSata drives have similiar power consumption the graph does not show for example during the power up stage the 1Tb takes much more energy compard to the lower capacity 500Gb model. I wanted to also see how the various individual SD cards varied in their power consumption, so each card was loaded in to a special rig where I could measure the actual power consumption of the card itself, the same sequential read test was re-run. WOW! While the Sandisk 200Gb MicroSD only draws ~65mA an amazing power consumption of only 214mW while being read from, the Samsung EVO 128Gb MicroSD on the other hand draws an incredibly high ~110mA a power consumption figure of 363mW. This is even higher than the full size Kingston U1 512Gb which only draws ~95mA a power consumption of only 313mW. I think all the devices performed well and will provide most users with plenty of musical enjoyment between charges, and how far are you from a USB charge port in your day-to-day life? I should point out mSata drives have varying levels of power consumption, several mSata drives in the 240Gb – 256Gb range will return runtimes approaching that of the HDD. In the 500Gb range again there is varying power consumption levels to contend with. The iFlash-Solo, iFlash-Dual and iFlash-Quad returned excellent runtimes, and whichever combination of card capacities you go for, you will get best in class runtimes. Power consumption figures for the MicroSD cards point to an interesting possiblity that 4 Sandisk 200Gb MicroSD cards, giving you a cool 800Gb iPod, or 2 installed using MicroSD to SD adapters in the iFlash-Dual giving you 400Gb will probably give you several more hours of runtime compared a single fullsize SD of 256Gb or 512Gb!! 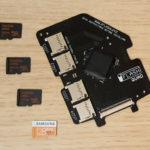 Of course you can install MicroSD cards in to either iFlash-Dual or iFlash-Solo using a passive MicroSD to SD adapter, if you want the extra bit of runtime at the cost of slower sync speeds. With mSata, you do trade runtime for the best price per GB, which maybe the choice you have to make if you need the highest capacity while keeping costs down. 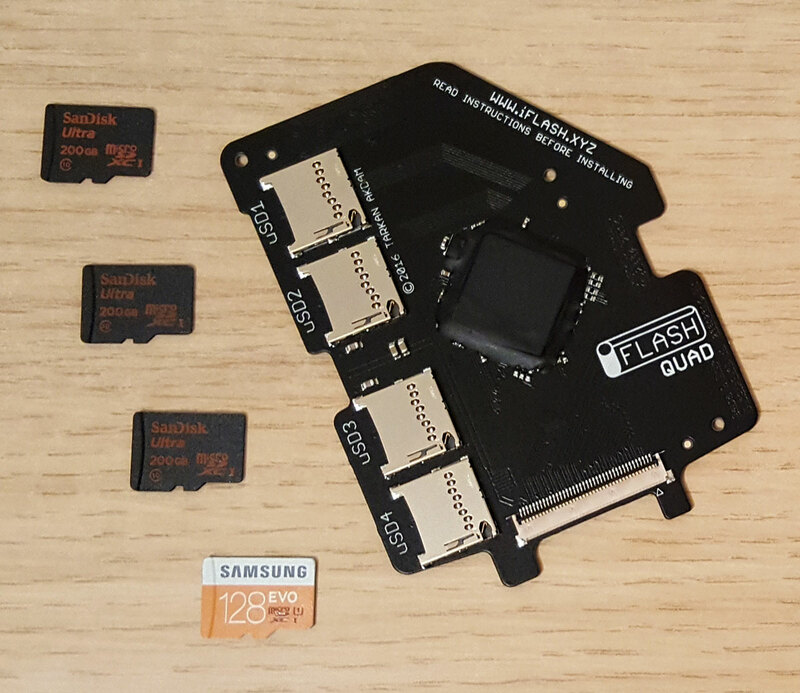 However the iFlash-DUAL and iFlash-QUAD do challenge this idea – 2 x 256Gb SDXC or even 4 x 128Gb MicroSD can be bought for less than the price of a single 512Gb mSata. Well Compact Flash card and the iFlash alone will give you about 20% increase in runtimes compared to the SDXC. But, the price per Gb for the 128Gb plus capacities are just too expensive. 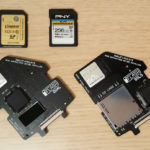 I have been fortunate in testing a few high capacity CF card engineering samples and I found compatiblity with the iPod to be suspect, several had badly implemented LBA48 (i.e. 256Gb CF cards) addressing which caused restore loop issues on the 7.5g iPod. @pdwalker and support: Thanks for your replies, guys. Just ordered the Solo for that extra bit of runtime. Let’s see if I can squeeze in into that little machine. @Sebastian – The measured read/write rates only effect transfers to and from the iPod – the user experience is not effected all, actually improved due to the fact SD cards have faster access times and of course no spin-up time (original HDD takes around 3 seconds to get ready). Hi Tarkan, this whole project leaves me just excited. Can’t wait to upgrade my old machine. Yet I’m still a little confused about the MicroSD performance. Do the read and write speeds have an effect on the user experience (scrolling, skippping) or is it just a thing about transferring data to the iPod? Please let me know and I’ll be ready to order. Thanks and keep up the good work! @Ryan – I tried this many years ago – and the ZUNE firmware is locked down to particular HDD hardware. It might be worth revisiting as I think it was only a 30Gb model I had access to. @tarkan I have a customer who is partial to Zune. I believe the Zune utilizes the same hard drives as Ipod. So my question is can your adapters be used on a Zune? Thanks. @Geir – 850EVO mSata works with the iFlash-Sata v7 – The SSD version does not work and is not the same as an mSata drive. However, it now seems like the 850EVO has been tested and working., can this be confirmed as I need to know if I will have to swap my disk in for SD-cards and get a 4xSD card instead of the ZIF to mSATA. @Support Good to know, thanks again. @Paul – I do not collate that kind of info. I do however have experience with them Toshiba cards, and they are very slow – I think we were only seeing something like 11-12MB/s during our tests. I did not find fault with them, just very slow. @Support Thanks for the quick reply, doesn’t seem much point shelling out on expensive quicker cards then if it’s limited to 25 mb/s. I don’t suppose you have a list of the write speeds and other stats tested on various micro cards? If not don’t worry about it at all. (ps. interested in the Toshiba Exceria in particular, offer on today) Otherwise I might just stick to the Sandisk Ultra, cheers again. @Paul – Yes the iFlash SD based boards are limited to 25MB/s. On testing between UHS-I U1 & U3 class cards (using fullsize SD cards) – generally U1 class cards achieved around 18 to 20MB/s, where as U3 class climbed up to around 21MB/s to 23MB/s. MicroSD cards tend to have much slower write speeds, and the maximum I have seen with my UHS-I U1 cards has been in the 15MB/s to 19MB/s range – but there is variation in that as well for example the Samsung EVO range are much slower then the Sandisk Ultra cards. Where the EVO cards are marked up as being faster!! Oh OK, cool! 🙂 Any idea on the rough timeline for that? I’m at the point of trying to decide between which of the two to buy for my new iPod project (already have the iFlash-Sata in hand, thank you). At first glance the 850EVO seems like the no brainer, but the enormous difference in Startup power consumption in the StorageReview comparison (2.01W for the 840EVO vs. 4.58W for the 850EVO) does give me pause. @edgedc – We always use the same iTunes library, playlists and iPod. The process and method is also the same between all our runtime tests – so results can be used across all the data. Great! Any chance you can do both versions of the 1TB, side-by-side in the same shootout? I ask this because unless you are using the exact same testbed for the new shootout as you did for the last one, the results may not be as comparable. @edgedc – As I mentioned in another comment, I noticed during syncing the 850EVO was much cooler than the 840EVO, which does show it is much more power efficent when active – which should translate in to longer runtimes compared to the 840EVO. On the next runtime shootout comparison we will use the 1TB 850EVO for mSata. So that makes me wonder which is better overall for the iPod (considering that it’s still the most cost-effective way to get a 1 TB iPod). Now I wonder if I rather use the mSata adapter. My goal is a one TB iPod as I want to use it with lossless m4a tracks only in my Audi. The price for two 512 GB SD cards (Kingston) and one 1 TB mSata drive (Samsung) is pretty much the same on Amazon. – is the iPod user interface even faster with mSata than with SD? – do you know if there will be a 2TB drive in the near future and would this be supported by iPod/iTunes? Wow Tarkan, Fantastic writeup and fantastic news. The news /info about the iFlash-Quad thrilled me no end.